150 feet off the coast of Sunset Beach in Cape May, New Jersey, a strange structure sticks out of the water. 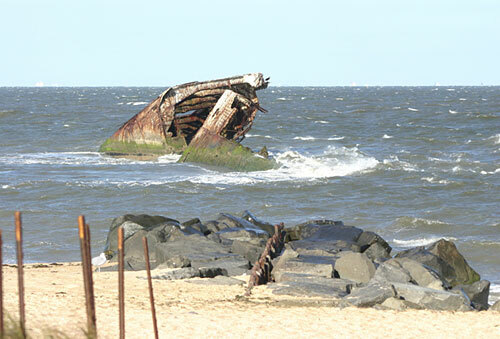 A sign by the edge of the road says that it is the remains of the S.S. Atlantus, one of twelve experimental ships built of concrete during the First World War, but "proven impractical because of weight." What did the Atlantus look like? Who would build a ship out of concrete? What happened to the other eleven ships? With the help of some books, websites and emails, I was able to find the answers to these questions. I learned of the S.S. Palo Alto, the famous "Cement Boat" of Aptos, California; the S.S. Selma, the honorary "Flagship of Texas"; the S.S. San Pasqual, which ran aground off Cuba, later turned into a hotel; and the S.S. Peralta, still afloat to this day, protecting a Canadian logging mill from the fury of the north Pacific Ocean. I also learned that the concrete ship experiment was not quite the failure that the sign implied - another fleet was built during World War II. I decided it was time someone gathered all this information in one website, so that others fascinated by these experiments in shipbuilding would be able to learn more about them. 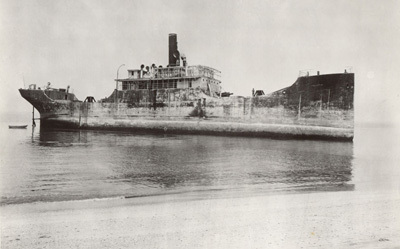 The S.S. Atlantus as she looked in 1926.